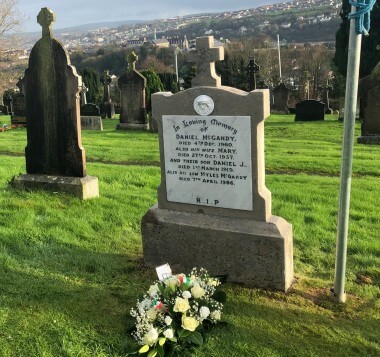 Republicans gathered in Derry City cemetery today to mark the 100th anniversary of the death of local IRA Volunteer Daniel ‘Dan’ McGandy. 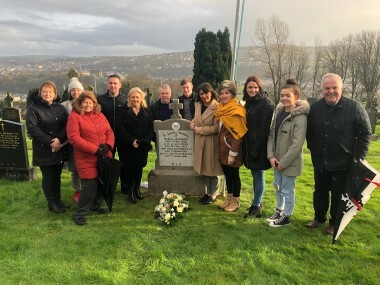 The commemoration was chaired by local Sinn Fein representative Sharon McLaughlin and was addressed by local Councillor Christopher Jackson. Dan McGandy is believed to have been the first Derry republican to die on active service during the 'Tan War' which began in January 1919. The war was sparked following events of December 1918, after Sinn Féin achieved a landslide victory in the General Election, returning 73 of 105 MPs. They refused to take their seats and formed the first Dáil Éireann, which met in the Mansion House on 21 January 1919. 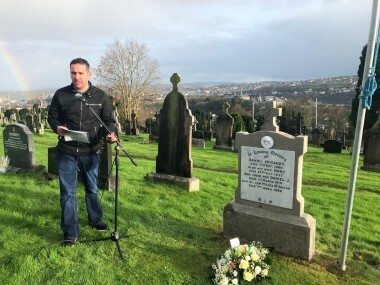 Speaking at the commemoration, Waterside Councillor Christopher Jackson said people in the local area were “immensely proud” of the role played by Dan McGandy in the fight for Irish freedom. “Dan McGandy was a proud son of the Waterside. His family and indeed the people of Gobnascale are immensely proud of the contribution he made to break the connection with England and achieve Irish freedom. “The political landscape in this city has changed for good, the unionist stronghold is gone, volunteers like Dan McGandy have led the way and we will always ensure they are remembered and commemorated with dignity and respect,” he said. Dan McGandy was a postman from Bardwell Place in the Waterside area of the city and was also member of the ‘Ten Foot Pikers’ - a name given to the local IRA active service unit. On the 20th January 1919, he was set to meet other IRA Volunteers at the Technical School on the Strand Road before heading to a local weapons stash nearby at Craig's Foundry. The Volunteers waited for over an hour, but Dan failed to appear. The next day, Dan’s coat, revolver and postbag were found along the Quay. The events of his death remain a mystery, but it is believed British troops intercepted the young republican and threw him into the River Foyle. Dan’s funeral took place on 1st March 1919 and he was buried in Derry city cemetery with full military honours. 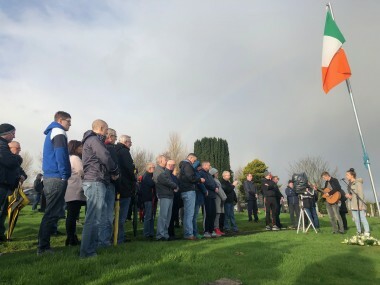 Today’s commemoration was the first in a series of local events to mark the 100th anniversary of the beginning of the Tan War and the establishment of the First Dáil. Concluding the commemoration, local representative Sharon McLaughlin encouraged people to attend an event taking place on Monday 21 January in Derry’s Guildhall to commemorate An Chéad Dáil. The event will be addressed by Sinn Féin Vice-president Michelle O’Neill.